Laptop keyboards can be awkward. Often, they are too small for comfortable prolonged use if you have large hands, and the key layouts can have awkward spacing to better fit the size of the screen. These keyboards are also generally flat or have a smaller angle than most external keyboards, meaning that posture suffers, speed decreases, and you may risk damaging your wrists in longer gaming sessions. Since the included keyboard is also attached to the screen, you may also find yourself leaning towards your computer for more comfort, but this can be damaging to your eyes and your back. When you add an external keyboard with your laptop, you have more flexibility with positioning, and the keyboards are more comfortable for extended use. Because laptops are made to be light, the keys on the included keyboards are often flimsy, meaning that they are easy to damage and could hurt the resell rate if you plan to trade your laptop in down the road. Another problem is that many laptops use scissor switches, which are not meant to be removed. 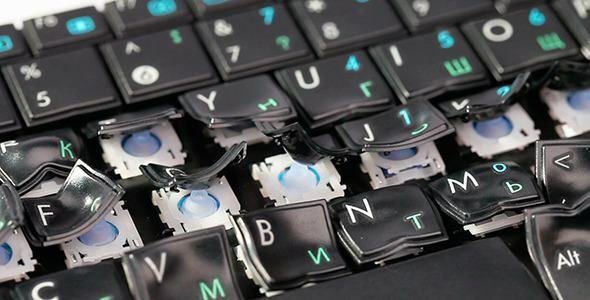 This makes laptop keyboards hard to clean and can lead to decreased responsiveness over time when grime builds up under the keys. Laptop keys generally aren’t as satisfying to press as other types of keys, due to this switch type, so you may find yourself missing your high-quality switches that tell you when the key has registered with an audible click. This can also decrease your gaming performance, as you may not know when the key press has registered. All of these issues are easily improved with external keyboards, which tend to be sturdier. They also have the added benefit of not adding wear to your laptop if you intend to trade it in later. It may seem counter-intuitive to add a new piece of gear to your mobile gaming set-up, but by simply adding a keyboard, you can improve your experience and performance while still maintaining an ultra portable system. Keyboards aren’t particularly bulky or hard to transport, particularly if you use a keyboard sling. They are also one of the lightest pieces of computer hardware, so you won’t notice much of a change in transportation or weight. This small adjustment can dramatically improve your on-the-go gaming experience without causing much impact in terms of inconvenience. Do you use additional external hardware ?